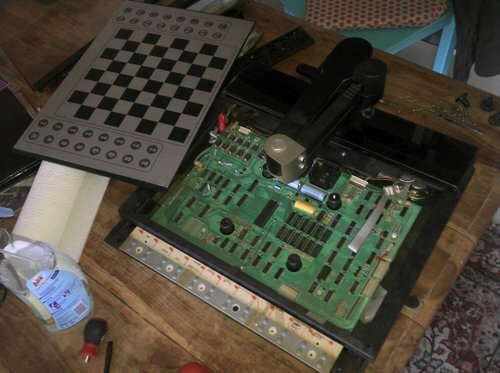 I was recently asked by a friend of mine if I and the folks behind our local DIY / maker initiative @makefurt could have a look into an older chess computer that would have some issues. 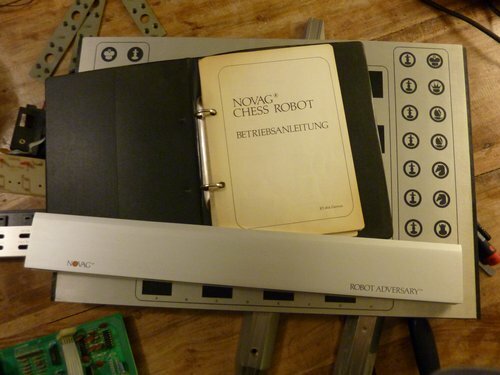 The owner – a former advertising designer here in Frankfurt who collects old movie posters and created this interesting website about it (in German) – came over today and brought this valuable robot to my place: the Novag Robot Adversary chess computer. 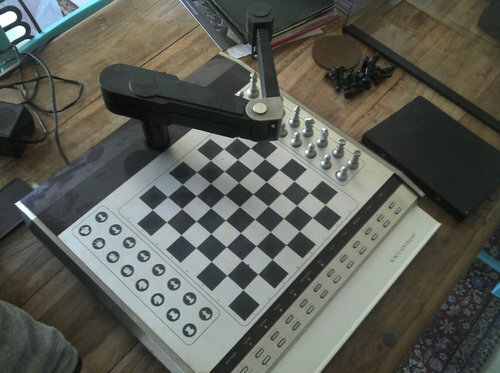 It’s a chess computer with a robotic arm that moves all chess pieces over a magnetic board, animating each move with an extra show. 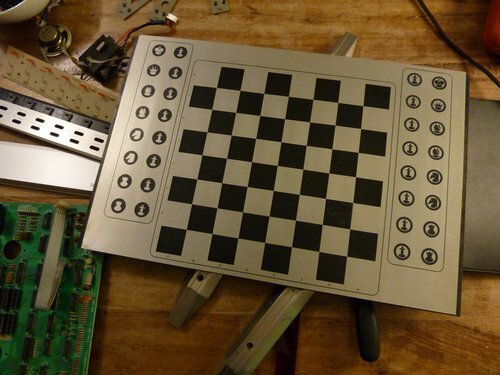 Hence it’s not just any other chess computer, but probably the coolest or most epic one out there. According to this Wiki page, this machine cost about DM 3000 back in 1982 which is about EUR 1500 and is powered by a Z80 (CPU) from Zylog, running at 7.5 MHz, has 5 KB of RAM and a 32 KB ROM. The motor that turns the robotic arm. Kindly note some previous repairs (badly done, imo). There are magnets for each position on this board (underneath). I’ll have another look at the robotic arm now and will then try to reassemble everything in order to keep all parts in one place and where they should be. If you’d like to help us fix it, please feel free joining us next weekend on October 30th, 2011 from 3-5pm at the Museum für Kommunikation here in Frankfurt. Or ping us anytime at info@makefurt.de // @makefurt. All are welcome! I’d love to be there! :-) That’s so cool! Dave love vintage electronics love Dave! Btw., DM 3000,- in 1982 would be around €2770,- today, considering the inflation. Hi Dave, thx for asking. I’ve reassembled it, plugged it in and it generates some random noise and random movements. Still buggy, somewhere. Could be a problem with the PCB or one of the motors. The front motor on the elbow doesn’t move, but this could also be related to dry contacts, still haven’t resoldered it. 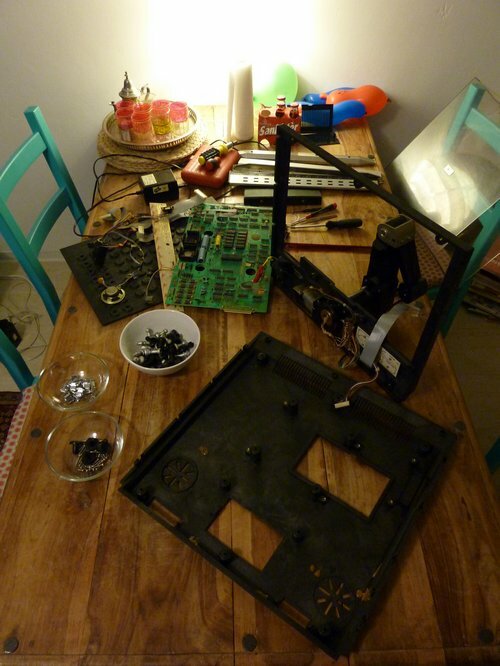 I also dismantled it a 2nd time, this time the robotic arm as well where I found the problem with the elbow-motor but also managed to fix the turning of the elbow. Reassembling that elbow is a royal PITA – but: doable. I read on another website that the two (!) fundis in Germany who repair chess computers hate repairing this particular machine. Now I know why. Whe are still to take this one to Hackerspace-ffm.de and see what the gurus will be able to do with it. What I am particularly looking for is a debug mode in the source. Something that will enable us to give commands to the robotic arm and make it turn around. Can’t you sort of disconnect the robot from the PCB, and then test all the individual motors with a power source? Just to see if they all respond. Then you’ll be able to isolate the problem whether it’s mechanical or electronic. How do the motors move the arm – is there a gearbox, or is it done by pulleys with rubber bands? Really amazing to think they could make something like that in 1982. Great, isn’t it? On one of the websites it also says that they’ve used DC motors on the final version which enabled these smooth movements. I could disconnect the motors and test them individually, but I think it would be smarter to debug the code and see if we can find a test mode or just simple commands to turn the arm in each direction without any external input. 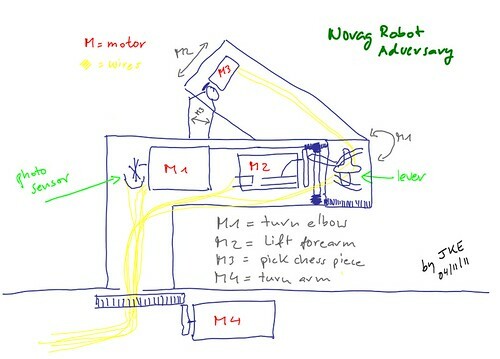 Shows the arm of the robot and how the motors work. 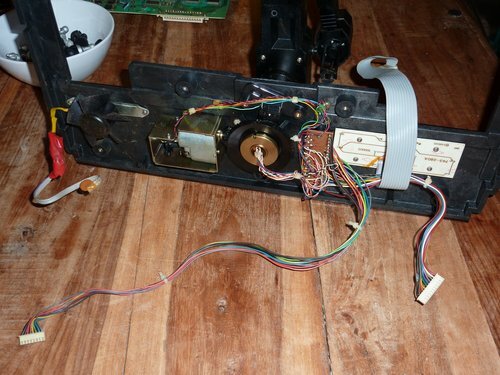 All wires are fixed to a PCB next to the bottom motor. 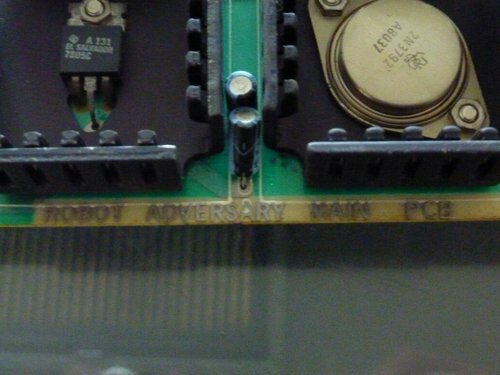 Not sure if that PCB has a test mode. It doesn’t necessarily need to have one. In 1982, when memory was still expensive, they might just have saved on adding a test routine. If you have dismantled, cleaned and tested the arm, then it should probably work. You can check later if it only has one bug, like a single motor not working or moving only in one direction. If it functions, then it’s probably something with the board. So you are searching for some documentation for it right now. I guess without it, you’ll be stuck (though it seems to be a relatively simple layout). 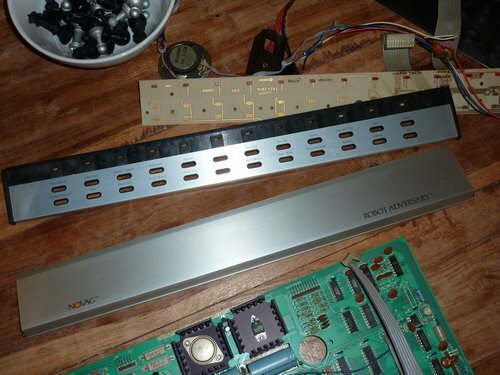 Things that often break down with time are condensators (drying out), and PROM-chips. 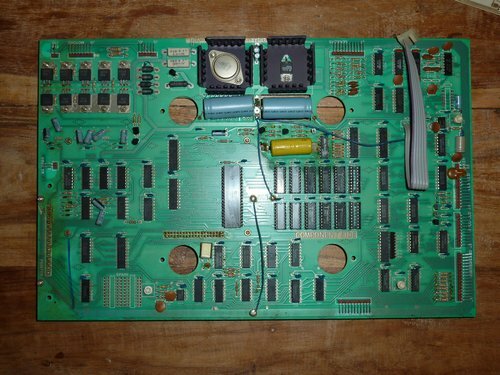 I once read an article about the restoration of an old 1979 PCB, where the guy unsoldered and removed all the old ROM-chips; he then soldered sockets in their place for future ease-of-replacement. After that, he “uploaded” the old software onto new chips, and installed those. Unfortunately I can’t find the link anymore (it’s been some years ago anyway). But for this sort of thing you definitely need to be some kind of a micro-geek. I myself couldn’t do something like that. Are you in contact with those “fundis” in Germany that you mentioned? Even if they “hate” this machine, perhaps they can give you some advice about it. They would also be the ones who could perhaps find you the required docs. Great stuff. Hope the device is now working properly. My father owned two of them in the 80′ and I loved them as a kid – unfortunately they had been stolen when they once broke into his house. I also had to repair them from time to time so I would love to have one again (unfortunately missed the latest auction). Do you have any success with fixing it in the meantime or what is the current status? Thx for all the feedback! I’ve meanwhile returned this to the owner and introduced him to the fine folks of hackerspace-ffm.de, a local DIY group. 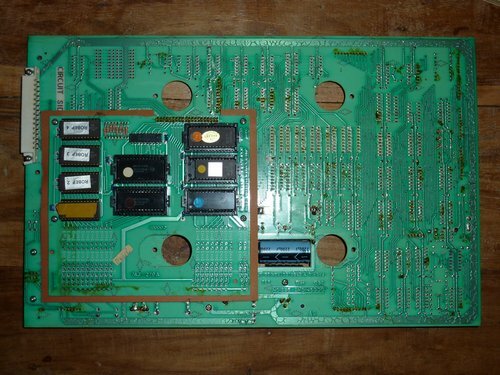 2. there’s something wrong with the parts on the PCB or maybe also a sensor that doesn’t return signals. 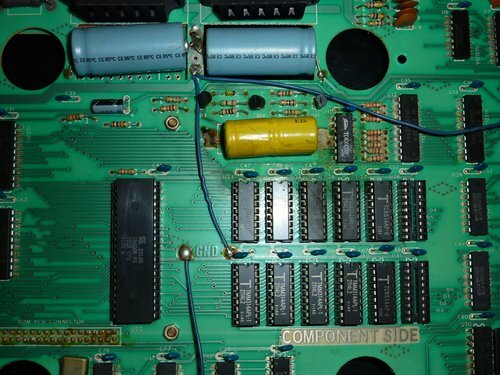 On the pcb, it could be the older RAM modules or electronic capacitors. We already used an alternative power supply, but it’s still the same. Also, we measured ~5v on pin11 of the Z80 CPU, so voltage regulation may be ok after all (the power supply is AC). I won’t be in the area for some month now, but it will be interesting if they can fix it. I will keep you updated on this. It’s a lovely machine with emotions, which makes it so interesting.